19' 11" 8' 8' 6" 19' 3" 7' 9" 7' 10" 7' 8" 7' 6"
Our most popular container size is capable of handling all jobs. This 20 foot box is strong, movable, and the most standard size for ISO shipping containers. These containers meet the demands of large jobs, while being practical for on the road. Our 20 foot container can be used and modified for all purposes. Whether it’s commercial or residential needs, like shipping cargo or creating a permanent retail shop, this container fits it all. How Much Can I Fit In a 20 ft Container? A 20 ft long container can generally fit about 25, 28 and sometimes 37 cubic meters (cbm) worth of goods inside. Of course, this depends on the size and shape of the goods themselves. Plus, Some larger boxes don’t stack as well as smaller boxes. Keep in mind also that we are talking about the inside capacity, rather than the cargo volume loadable that will be less due to air space left among the cargo packages. TEU is a common term in the shipping container industry. It stands for Twenty-foot Equivalent Unit. But remember, it’s a unit not a container. The unit denotes space or capacity in equivalent to a 20 foot shipping container. It is used to determine the capacity of container vessels, throughout of terminals, etc. Think of it this way, a container ship with nominal capacity of 6000 TEU means it has enough space for 6000 container 20ft. It can also stand to reason that a 40ft container is considered 2 TEU’s. There is a less common term that is sometimes used and it is 1 FEU (Forty-foot Equivalent Unit). 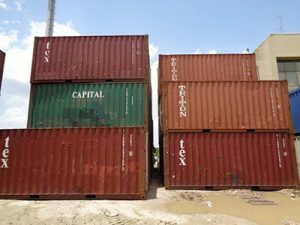 Whether you need a short-term storage container to rent, or would like to buy a shipping container, a twenty-foot container is a good way to go. Advanced Container knows this is the most popular size, so we keep them in stock. Twenty foot containers are commonly used by business for so many applications, it would be tough to list them all. They are the ideal size to fit in tight spaces but still meet most modular storage needs. They come with different door configurations and can be easily converted into mobile office spaces, rest rooms, workshops and safe storage. People have found some really creative ways to use twenty ft shipping containers. They have made complete multi-level storage buildings by stacking them on top of each other. It is really popular to convert them into mobile shops, bars, cafes and food trucks. And of course, tiny homes are the trend. One of the most interesting is a custom container swimming-pool. Advanced Container stocks a huge variety of 20ft containers with different configurations to meet anyone’s needs. Options include 20′ double door, 20′ open top and 20′ open side. We also custom fabricate containers, just let us know what you need. 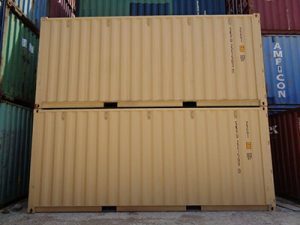 Contact us to buy or rent a new or used 20ft container today.